Stand up paddle boarding (SUP) is the ultimate outdoor sport.. Not only does it give you an amazing workout, but you get to do it on the water, under the sun and amongst some of the world’s most beautiful scenery and wildlife. It’s no surprise that paddle boarding is STILL the fastest growing water sport in the world! Here’s a list of some of the best spots to paddle board in the US, from San Diego to Florida. Make sure you leave a comment below and tell us your favourite (or if we missed one)! With its year-round sun and focus on fitness, California is well known as a place for all kinds of water sports. Although there are a countless number of places to paddle board we’re only listing the absolute top paddle board spots in this glorious state. We start off this list with the stunning Lake Tahoe – a freshwater lake in the Sierra Nevada. Stand up paddle boards have recently taken over the lake and stand up paddle boarding events have become very popular. This is due to Lake Tahoe’s crystal clear blue waters that provide a perfect view of the huge granite boulders sitting at the bottom of the lake. As you paddle board around Lake Tahoe, you also get to enjoy the scenic snow-capped mountains surrounding the lake. Lake Tahoe, together with Hawaii is known as one of the originators of the sport of paddle boarding. This together with the paddle boarding events taking place in summer and early fall make this definitely one of the best spots to stand up paddle board in the world. The Ta-Hoe Nalu Paddle Festival is held roughly in the middle of August at Kings Beach, North Lake Tahoe. It is the longest running and largest SUP race event in the United States. It’s a family friendly event with various competitions including both distance and beginner races. There are typically more than $10,000 to be won in cash and prizes. The Tahoe Cup, a racing series held in September includes the Tahoe Fall Classic, a 22 mile point-to-point paddle race from El Dorado Beach in South Lake Tahoe to Kings Beach State Beach. It is the longest inland distance paddle board race in the world and draws hundreds of competitors from all over the country. Enjoy the below video of paddling boarding in Lake Tahoe – surely one of the best paddle boarding spots in the world. The La Jolla Cove in San Diego, California is a very small beach tucked between sandstone cliffs. There is a reason why this is one of the most photographed beaches in Southern California – its scenic beauty. That’s of course what makes La Jolla another top spot for stand up paddle boarding. Lying within the Underwater Park Ecological Reserve means that marine life is plentiful here. You’re sure to see sea lions swimming underneath you or soaking up the sun on the rocks as you paddle board in this unique spot. You’ll also get to enjoy plenty of other marine life such as dolphins, colorful garibaldi, yellowtail, rays and (if you’re lucky) even leopard sharks. The cove itself is completely sheltered from surf making it an absolutely excellent spot for paddle boarding on flat water. If you’re ready for some additional adventure, try to get into one of the caves for a huge surge of adrenaline whilst enjoying the breathtaking surroundings. San Diego SUP rentals are more than happy to take your around or rent paddle boards or other SUP needs you may have in San Diego. Another hot SUP destination and surely one of the best spots to paddle board in the world are the shores of Coronado Island, just off San Diego. Coronado Island is a great spot offering the best of both worlds, whether you just want to take it nice and easy or whether you’re up for an adrenaline pumping surf session. The shores are sandy all the way, so you don’t have to worry about reefs or rocks. If you’ve got a few hours on your hands and are up for the challenge, you might want to hit The Loop – a 10 mile long trip around the island, most of which can be done paddling. It’s not for the faint of heart – if you get even a slight breeze, the long stretches along the island can wear you down. If you’re lucky you might catch a few good waves which will give you a nice break. The experience and views are truly one of a kind. You will get to experience a perspective of the island from an angle which is quite unique – a view incorporating the Hotel Del Coronado, the Coronado shores, the Downtown skyline, the Coronado Bridge and the mountains in the background – all at the same time. San Francisco is usually more reknown for being a hot tech scene and for its other attractions such as the Golden Gate Bridge, Alcatraz and the sea lions at the various piers. Yet, you can also enjoy many of these attractions by paddle board. In fact, San Francisco is a very lively SUP location. The SUP community hosts annual events such as Battle of the Bay (a full water sports festival) with Red Bull also throwing a massive event in October of 2016. San Francisco Bay paddlers will likely see quite an array of birds wing past — gulls, cormorants or loons, depending on the season — while they admire the ever-present views of fog swallowing the Golden Gate or enjoy the vistas of the city’s landmark skyline of downtown San Francisco and the towering hills that ring the San Francisco Bay Area. Head to Boardsports school and shop or SeaTrak for classes, tours and custom trips. The scenic Malibu beach in Los Angeles has always been a surfers paradise. 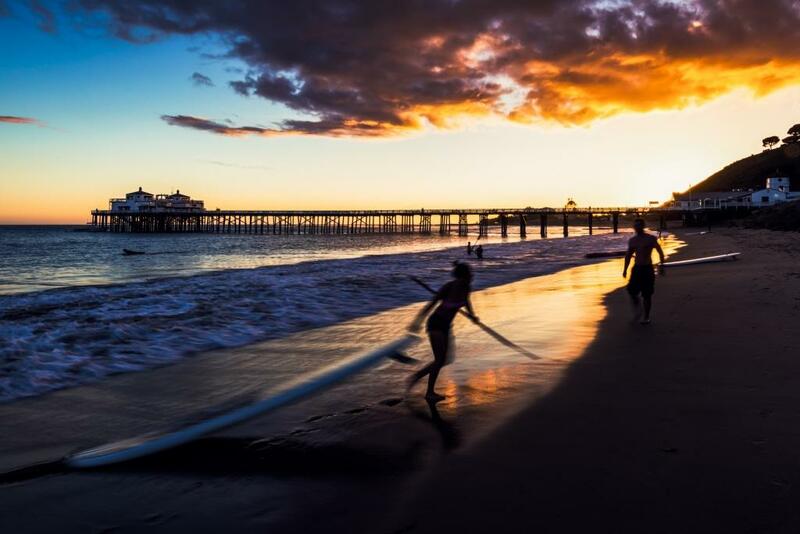 While LA is famous for it’s many beaches, and there are plenty of spots for great paddleboarding in the area, many believe that Malibu stands out as the very best. This is due to the magnificent views, miles of stunning beaches (particularly at sunrise and sunset) and the abundance of wildlife. While Malibu is always crawling with surfers, by heading out past the most popular breaks you’ll find waters ideal for paddling without the crowds. The picture-perfect Point Dume with its wild coves is a must, whilst the Malibu Surf Shack guided tours are known for their paddling up the coast, past cliffs and kelp beds that are home to an array of wildlife including sea lions and seals. This great imagery caught by drones shows why Malibu is so famous for paddle boarding. Looking for SUP stuff in Malibu, head down to Malibu SUP or Hana Paddle Boards. We’ve been mentioning quite a few paddle board spots which have plenty of wildlife. Yet, if you are brave enough and are up for some spectacular wildlife encounters, Redondo Beach in California is the ultimate paddle board / wildlife combination. Redondo beach is frequented by fin whales which are one of largest creatures in the world, second only to the blue whale. Whilst getting as close to the whales as the above photo may not be wise, you can still keep a safe distance while enjoying the adrenaline rush that comes with sharing the water with these magnificent creatures. Have a look at this preview of SUPing in Redondo beach or this close whale encounter. Head to Tarsan Stand up or the Paddle House if you’re in the area. San Clemente, a small beach town in southern Orange County is an up and coming stand up paddle boarding location. It’s great all year round weather and beautiful beaches are part of the reason. The other reason is that many of the largest SUP brands are basing themselves here. That of course means that San Clemente is teeming with SUP pros and industry professionals – which means there’s going to be plenty of events throughout the year where you’re bound to meet some of the top names in the sport. “San-O” or San Onofre State beach is one of the SUP hot spots – do get yourself out there if you’re around. Brawner Boards and San Clemente Surf Board Rentals are two popular places where you can rent paddle boards or get tours. There is a reason why Dana Point is one of the top spots and most well-known paddle board spots in the world. Dana Point is home to the biggest, baddest SUP event: the Pacific Paddle Games, besides hosting plenty of other SUP events like the SUPIA Summit and more. If you really want to get tempted to get down to Dana Point,check out the awesome photo galleries at the Pacific Paddle Games website. Dana Point is surrounded by a seven-mile playground of coastal bluffs, sparkling shorelines and the stunning blue Pacific Ocean. The Headlands in Dana Point is a 50-acre beautifully protected site with spectacular views overlooking Dana Point Harbor and the Orange County coast. A few other places that are great for paddle boarding in Dana Point are Baby Beach, Dana Point Harbor and Doheny Beach. Dana Point Jet Ski and Kayak Center and Infinity SurfBoard are a great source for local knowledge, rentals and everything else SUP. This guy at Dana Point surely had the experience of a lifetime when a young sea lion joined him on the paddle board. If you’ve been to Venice in Italy, you know that the busy canals are not the best spots for SUP. Yet, if you want to experience something similar without the waterway congestion, you might want to try out the Naples Canals in Long Beach, California. You’ll be paddling alongside the rich and famous, with grandiose houses and luxury boats keeping you company. However, if you’re more fascinated by sea life rather than the rich and famous, there’s a great adventure in store at Long Beach. At Long Beach, you’re quite likely to find yourself paddling next to a pod of friendly dolphins. Dolphins are quite curious creatures, so if you head out to the Ultimate Dolphin Adventure with Standup Rentals, you’re in for a real treat. Head to the SUP Cafe or near Belmont Shores or Standup Rentals for some local guidance. The Black Canyon, a 12 mile stretch along the Colorado river has long been a mecca for kayaking. That of course means it’s also a perfect spot for stand up paddle boarding. Canyons of course offer spectacular, overwhelming views – particularly as the river gets narrower and you’re literally flanked by the seemingly never ending cliff faces of the Black Canyon (which incidentally gets it’s name from the fact that parts of the gorge only get 33 minutes of sunlight a day). The Black Canyon Water Trail starts at the base of the Hoover Dam which is a spectacular scene in itself. The Black Canyon part of the Colorado river is completely flat water making it perfect for paddle boarding. There’s also plenty of hiking to be done at various parts of the trail so you should plan the paddle in advance to make the most of these hikes too. The Caves, the Nevada and Arizona hot springs and the Boy Scout canyon are only a few of the top spots in this spectacular paddle boarding destination. The Black Canyon is part of the Gunnison National park meaning you’ll need to get a $17 permit from the National Park Service. These are limited in number to ensure that traffic to the canyon is minimized. That of course means, once you get there, the place won’t be crowded. However, as mentioned above, you’ll need to plan your trip in advance. BlackCanyon Adventures can serve all of your paddle board needs in the Black Canyon, whilst KayakLasVegas can also provide SUP rentals and tours. Hood River is often referred to as the wind-surfing capital of the world, however, in recent years, paddle boarding has also taken off in this region. Renowned for its spectacular views of the snow-capped Mount Hood, Hood River is also home to one of the biggest paddle board events. The Naish Columbia Gorge Paddle on the Hood River’s Waterfront park draws in hundreds of the competitors every year with the event featuring both a Distance Downwind Race and a Course Race. Some of the biggest names in SUP such as Fiona Wylde, hail from the Hood River. SUP in the Hood River is a great way to explore the remote wilderness. As you paddle through challenging rapids whilst surrounded by towering pine trees, you’ll feel more than ever that SUP and nature are a perfect fit. Need to find SUP buddies in Hood River, head to Big Winds, or Hood River Waterplay. The Florida Keys are one of the best SUP trips for encountering wildlife. Particularly in between Stock Island and Key West, the two westernmost flecks of land in the 822-island chain a mile-long channel through a mangrove forest called Cowkey Channel weaves through hundreds of tidal creeks and passageways just wide enough to paddle through. You’ll be able to see all sorts of wildlife here, including barracuda, octopus, rays, manatees, and a countless variety of birds. Areas such as Silver Springs State boast super clear spring rivers. If you get there early, you’ll be able to enjoy the area all for yourself and with the water being so clear that you can see the river floor. It will feel like you are just paddling on air. Need some paddle board stuff in Florida, head down to Paddle! Or SupKeyWest for all your SUPing needs. Seattle is sandwiched between the Puget Sound, fed by the Pacific Ocean to the west, and freshwater Lake Washington to the east. Besides that, the lakes of Lake Union, Green Lake, Lake Washington, Elliot Bay and Shishole Bay have all become popular places for paddle boarding. The Duwamish River, and Alki Beach are also popular hot spots. With the Cascade and Olympic Mountains as your backdrop, Seattle is a particularly scenic ride. Stand up paddle boarding on Lake Union, you’ll be drifting by the famous Space Needle, whilst watching seaplanes come and go; an experience that is hard to beat. Races are also held every weekend during paddleboard season, from May 1 to the end of September. Among the popular races is the Round the Rock race, a 13-mile September event around Mercer Island on Lake Washington. Want to catch up with the locals? Head to Ballard Kayak or Surf Ballard. The Buffalo Bayou is a 26 mile paddling trail that begins near Highway 6 on the West side and takes you through downtown Houston. With several access points along the trail, there’s plenty of options if you don’t want to do the full 26-mile trail. You can find a very detailed list of the access points, float times and plenty of other details about the Buffalo Bayou paddle trail here. If you want to meet the locals for some guidance, the guys at Bayou Shuttle Service can take you to the trail so you can avoid parking there, whilst also providing tours, rentals and a lot of important info about the trail and the different access points. The Sabine Street promenade to Allen’s Landing Park (access points 9-10) are a really great part of this SUP trail which should take you no more than an hour at an easy pace. The guys at Paddle Board HTX are also a great bunch if you need any SUP stuff. In fact, here’s a video they shot of SUPping on the Buffalo Bayou trail. Another great paddle boarding spot in Houston is the Armand Bayou paddling trail. The trail following Armand Bayou from its confluence with Clear Lake, through the Armand Bayou Nature Center and then on to Horsepen Bayou – where you are quite likely to see 10 foot alligators. The whole area is a part of the Armand Bayou Coastal Preserve and that means that you’re likely to encounter much wildlife, particularly birds. Amongst the common birds found in the area are Ospreys, Roseate Spoonbills, various egrets, herons, and pelicans. You can find a trail map, access points and other general info on the Texas Parks and Wildlife Department site. Head out to Trail Expeditions or Pinky’s Kayak Rentals for tours and rentals of paddle boards. The Galveston Island State Park offers another great trail in the waters that surround it. Most of the trails at Galveston Island are protected by breakwater which makes it a top spot for paddle boarding. Trails vary in length from about two and half miles to about 5 miles, so there’s a little bit of everything for everyone. You can also hike along the dunes on the Gulf side. The Galveston Island State Park Paddling Trail map has all the details about these trials. Island Standup together with SUP Gulf Coast are your reference points for rentals and guides at Galveston Island. The Ocean Fest Galveston is an annual event which is gaining popularity at Galveston – typically held around July. Here’s a bit of a preview of the G-Bay Paddle Race – looks like quite the event! The Apostle Islands on Lake Superior are a stunningly unique paddling experience. The greatest attraction for paddleboarders here is the opportunity to paddle into the amazing caves and get an upclose look at the beautiful rock formations. Check out Apostle Island Kayaks for SUP gear and tours, located on Madeline Island, the largest of the Apostle Islands. Wildnerness Inquiry also offer various Apostle Island trip options. Here’s a video preview of what SUP on Apostle Island looks like. Paddle boarding in Manhattan will provide you with a good dose of all the right elements. With picturesque views of the Brooklyn Bridge, the Statue of Liberty, and the glorious Manhattan Skyline, you are in for a truly rewarding experience. There are opportunities for paddling right in Manhattan along the Hudson River; particularly at sunset when the skyline magically transforms. For the more experienced SUPers, Croton Point Park or Rockaway Beach in Queens provide a more challenging option. The Manhattan Kayak Company can provide everything for your Manhattan SUP experience. Resilience Paddle sports also offer tours, rentals and whatever else you may need. Austin, Texas has experienced an influx of SUP enthusiasts in recent years due to the end of the drought which has seen the waterways flowing once again. The Lower Colorado River which lies southeast of Austin, provides a tranquil stretch for SUP with untouched lush Central Texan native fauna and an abundance of aquatic wildlife. Alternatively, if you want to experience a truly special atmosphere, plan to paddle along Zilker Park during The Austin City Limits Music Fest in October. Listen to a great lineup of amazing live music while getting your paddle on. Check out Stand up Paddle Colorado or Austin Paddle Sports for local guided tours and rentals. Whilst Padre Island is typically more reknown as a spring break destination, you might want to ease up for a moment and go for a relaxing paddle around Laguna Madre Bay on the west of Padre Island. With perfect weather, this is a great spot to explore and ride waves on your paddle board. Air Padre Rentals are the main shop on Padre Islands should you need access to some local knowledge. Colorado – not just a top spot, but a whole state where there are so many paddleboarding opportunities that it is difficult to narrow it down to just a few. The white water season, particularly between May and July is the main attraction and the high season for paddle boarding. While stand up paddleboarding the Arkansas River is a unique way to experience Colorado, it is generally better suited to the more experienced paddleboarder. The Salida Town Run and the white water park in Buena Vista, can be a challenge for those just starting to paddle board, however, it’s the ultimate playground for the more adventurous paddlers. River Runners provides tours to a number of locations, including destinations where you’ll encounter class II rapids. The Salida Play Park is even more challenging with Class III rapids, where the more experienced can have their fun. This park consists of two waves/holes depending on water levels and depending on flow, the waves here can be world class. The lower hole is great for beginners to expert paddle boarders. The hole is great for loops and is backed up by flat water for recovery. Throw in some epic views of Mt. Princeton in the background, and you have an all round top paddle board spot. BadFish SUP based in Salida can also handle all your Arkansas River paddle board needs. This video from BadFish is a bit of a preview of the excitement of SUP’ing on the Arkansas River. Grand Lake is Colorado’s largest, deepest and quite possibly most beautiful lake. The mountain scenery surrounding the lake is sublime – making this a definite bucket-list destination for paddle boarders. The Grand Lake is located close to the Rocky Mountain National Park and the town that goes by the same name. Rocky Mountain SUP Colorado and the Grand Lake Marina are ready to take care of your paddle boarding needs when you’re down at Grand Lake. Whilst there are plenty of scenic easy-going flat-water paddling options in Colorado, more experienced SUPers can also find plenty of adrenaline-inducing rapids. The Glenwood Springs Whitewater Park is a great choice. Already from its name you can anticipate what’s in store for you. It’s the first whitewater park built on the Colorado River and an excellent choice to hone your advanced paddle board skills. You can check out current flow levels on their site before heading down to the park. If you want to SUP in the company of a world class SUP athlete Brittany Parker, head down to Glenwood adventure, where you can attend one of her clinics or maybe get the chance to see her surfing a few river waves. Colorado also has one of the busiest SUP event seasons especially during high season. Have a look here to check out the SUP event calendar in Colorado on the Colorado SUP club website. Idaho is known as the “Whitewater State” for a reason – it has more navigable river miles than any other state in the US, besides plenty of alpine lakes, all in the midst of national forests, mountains and deep gorges. Central Idaho is particularly concentrated with top paddle board spots. If you’re looking to paddle in unspoilt nature – this Rocky-Mountain state is the place to go. The Salmon River starts in Sawtooth Range, near the Galena Summit and runs for 425 miles through Central Idaho before its confluence with Snake River – making it the longest free flowing river in continental United States and the largest wilderness area. Its remote location has minimised human presence in the area leaving it largely unspoiled. Much of the river is good for paddle boarding – and there are options for beginners, professionals and everyone in between. For a 5 minute preview of what SUPing on the Salmon River looks like, check out this video. Looking for some guidance, rentals or tours? You’re spoilt for choice. Momentum River Expeditions, Sawtooth Adventure company, and OARS are great picks. The Columbia River Gorge is one of Oregon’s most popular SUP destinations. It’s also one of the top downwinding destinations in the world. The Gorge has strong, predictable winds that blow across the surface of the expansive Columbia River. This natural event creates incredible downwinding conditions, with 30-40 mile per hour winds not being uncommon. These winds blow in the exact opposite direction of the current most of the year. This makes for some surprisingly large river waves perfect for some of the most challenging downwinding outside of Hawaii. In fact the “Viento Downwind” tour is probably the most popular in this spot, and makes for an awesome seven mile journey to Hood River. Big Winds, a top water sports shop in downtown Hood River, offers a downwinding shuttle service to Viento State Park during the summer months, to make the best of the excellent downwinding conditions at their peak. In terms of events, you can head to the Columbia Gorge Paddle challenge, a SUP event which has been going on since 2011. Besides Big Winds, another local SUP guided tours and rentals shop in the Gorge Paddling Center. One of the most scenic strips of natural beauty in North America has to be the Oregon coast. Conditions are predictable for most of the year. Strong prevailing onshore winds and wintertime storms swell out of Alaska pushing cold water and huge swells along the way. So much so, thirty foot swells are not uncommon in the winter months. Nevertheless, in the right conditions, the Oregon coast has a good collection of SUP worthy spots to surf or explore. The Oregon coast temperatures are relatively consistent with moderate temperatures all year round. The coastline stays above 38 fahrenheit and is typically in the low 40’s or mid 50’s in the winter months even as inland snow and ice prevail. Head to SUP Manzanita or Clatsop Paddle Company for rentals and local guided tours on the Oregon Coast. Wilmington is not a place per se, it’s more of a term for the Cape Fear Coast which stretches from Topsail Island down to Carolina Beach, Kure Beach, Bald Head Island and Holden Beach. The great thing about SUPping in North Carolina is that there’s surf, flatwater, wildlife and always some good company to paddle with. The culmination of the Cape Fear paddling community is without a doubt Wrightsville Beach, where massive paddle board events such as the Cold Stroke Classic, the Surf2Sound Challenge and the Carolina Cup are held. Whether you are a beginner or a badass, there’s a place for paddling in Wilmington. The barrier islands offer secluded surf breaks, protected flatwater, wildlife, fishing and one of the most welcoming paddle communities around. The best way to get into a paddle community is through one of the meetup groups or through Facebook where you’ll always find someone in Wilmington to take you out and show you the sights on the water. The Carolina Cup itself has a gruelling race which sees the world’s best stand up paddle boarders competing in the Graveyard Course. The elite Graveyard course is not the only event here though, there’s a kids race, a recreational “Harbor Island” race and the Money Island open race. There’s plenty of stuff going on in the five-day event, so don’t be deterred by the level of the competition. Of course, the Carolina Cup is the peak of SUPing in Wrightsville Beach. The beautiful flatwater of the southern North Carolina waterways and pristine Atlantic Ocean are all excellent paddle board spots. There’s also plenty of other beaches where the waves are great for SUPing. With local guides such as the instructors at WrightsvilleSUP finding a perfect spot for any tide or weather, there’s virtually a perfect place to paddle board any day of the year. If you’re looking for something truly different, you might want to check out the Night SUP tours, where you’ll experience a whole new perspective on paddle boarding. Wrightsville beach is truly a perfect paddle board getaway for paddlers of any level. Tofino, located along the untamed and and isolated shares of Vancouver Island is known for quite a few things: the cool temperate climate, the palm trees (which you’d really not expect to find there), the whale watching and the wicked Pacific surf. SUPing has been recently gaining ground here and Canada held its first SUP surf contest in Tofino in 2014, which has since been held annually. If you’re looking for some great SUP surfing, check out the fast, 5 meter high waves at Cox Beach in summer, or the consistent but tamer waves at Chesterman Beach. If flatwater SUPing is your preference, Mackenzie beach is usually calm, although with just the right conditions, you may be able to catch a few small waves. In general, the calm waters and peaceful natural surroundings make it the perfect spot to combine yoga and SUPing. Tofino Paddle Surf have all you’ll need for SUPing in Tufino, as do T’ashii Paddle School. We now leave the continental US for our final few top paddle boarding spots. If you’re not afraid of paddling in the cold, Alaska is another top paddle boarding hot spot, which offers quite a unique experience. Few places in the world can offer untouched nature like Alaska, the Last Frontier. Stand up paddle boarding has really picked up in southcentral Alaska in the last few years, and it’s easy to see why. With lakes everywhere you look, and glacier/ocean SUP adventures beckoning just a few hours from Anchorage (or closer if you’re willing to try the Alaska bore tide!) – the Anchorage region has an amazingly enticing combination for the SUP enthusiast. The majestic Wasilla Lake found in the Matanuska Valley north of Anchorage is a prime stand up paddle boarding spot for flatwater SUP. The Eklutna lake is another great spot, not too windy and with hard to beat surrounding views. Portage Lake is an awesome paddle board spot with plenty of icebergs along the way, and a short paddle to the glacier. Mirror lake is especially captivating at sunset. There’s plenty of other regions in Alaska for great SUping such as Eagle River, Fairbanks, the Turnagain Arm Bore Tide and Seldovia Bay to name a few. Standup Alaska can be your local guides if you’re planning to paddle the majestic Wasilla Lake in the Matanuska Valley. Alaska Wildnerness SUP is another of the fine SUP shops in Alaska. Here’s a glimpse into exploring the Last (Frozen) Frontier. If the cold weather is not your thing and you’re more inclined to enjoy the warm Caribbean weather, the Riviera Maya is the place to go. Start off at the pristine, white sand beaches at Playa del Carmen. Besides being surrounded by mangroves, the reefs are teeming with sea turtles and other marine life. Although you’ll be able to see everything from your paddle board courtesy of the clear waters, a pair of goggles is a must if, like many, you are unable to resist the temptation to pop your head underwater for a clearer glimpse at the marine life. Similar conditions are found at Tulum, a bit further south, where you’ll also find a few, tame Caribbean waves that offer a fun ride. Tulum (famous for Mayan ruins) is better known as a yoga haven than a surfing one, so can easily be incorporated as a cool down option after a SUPing session. You might also want to check out one of the famous Mexican cenotes (sink holes) which are also great places for SUPing whilst enjoying the sights and sounds of the jungle wild life. Check out Ocean Pro kite or Playa de Carmen Kite boarding, one of the many SUP shops for SUP rentals and tours in the Riviera Maya. We’ve kept the absolute top spot for paddle boarding for last. SUP’s modern story comes from the Hawaiian islands, where the Hawaiian translation is “Ku Hoe He’e Nalu” meaning to stand, to paddle, to surf a wave. It of course makes sense that the place which offers the best spots to surf and SUP is the place where SUPing was born. Surfing in Hawaii naturally led to SUPing and being how Hawaii brings some of the best surfers from across the world together, you can understand how paddleboarding quickly spread across the world. Whether you want to hit up the beaches at Waikiki or just paddle along the calm waters at Sunset Beach during summer, or you’re brave enough to face the 15-foot winter waves – Hawaii should definitely be on your bucket list if you want to call yourself a real SUPer. It’s only natural that downwinding is also very popular in Hawaii. You can ride the fast four-miles from Sunset Beach to the coral reefs at Waimea Bay. The real pros can follow the 32-mile downwind path set by the M20 Paddleboard World Championship. Starting at Kalua Koi on the island Molokai, you’ll need to then cross the grueling Ka’iwi channel to Maunalua Bay Beach Park on Oahu which will surely test your endurance to its limits. And that’s a wrap! That’s our choice of the top paddle board spots in the US. Which ones have you visited? Which is your preferred SUP spot? Which ones would you REALLY like to visit? And don’t forget to share any other awesome paddle board spots we may have missed in the comments below.